Part text book, part recipe book, part tasting field guide, all sum up to a love letter to what is arguably the greatest and most misunderstood spirit out there. If you’re in the industry, Tony Abou-Ganim needs no introduction. When he started his career years ago at his cousins bar in Port Huron Michigan, it was all about passion for the craft and holding true to what his cousin Helen taught him; “There are no short cuts to quality”. It was that commitment to excellence that made him a legend in his field, considered by many to be one of the greatest mixologists ever. His cocktail programs have been sought after by some of the biggest names in the restaurant & hospitality business; Harry Denton, Steve Wynn, and Mario Batali just to name a few. VODKA DISTILLED is roughly 200 pages if you exclude the bibliography and index; broken down into five chapters discussing vodka’s history and heritage. Loads of beautiful photography throughout the book, courtesy of Tim Turner. OK, so how was the book? The book is really broken into three sections. Each section can stand on its yet builds on each other. The first section is the first three chapters and is a discussion on vodka, its history, where it comes from, how it’s made, and how we define it. The second section is a little more personal in that it addresses how we should enjoy vodka. From the temperature, to the glassware, to the ice, Tony recommendations help us to get the most out of vodka …and how to get its character to “reveal” itself. It may seem elementary but when you read it, you’ll see it isn’t. It continues with a selection of cocktails, no book on any spirit would be complete without a list of recipes. Initially I half suspected the recipe section to be just filler but instead you see Tony is really showcasing vodkas versatility. His personal anecdotes on each drink was a nice touch. More than just learning how to make a cocktail, you all begin to appreciate each for its uniqueness in taste and personality. The last section is on taste…specifically how to taste vodka as if one was on a tasting panel. He describes taste descriptors commonly associated with different types of vodka in addition to mouth feel, finish, and overall character. Tony goes further and reviews 58 different vodkas, each with its tasting notes and other vital stats. They’re not judgements (only you know what you do or don’t like) rather it’s an introduction to the brand with enough concise information about it so you know what you’re getting into. My opinion, it was a really good read, and a quick one at that. The tasting notes I found to be the most valuable for me and I know I’ll often go back to it as reference. What better teacher than the father of modern mixology right? 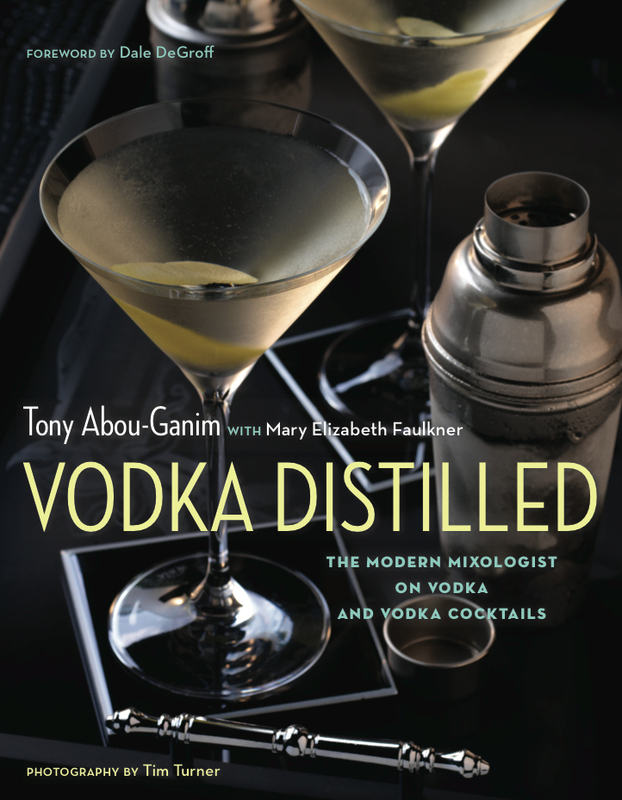 Vodka Distilled will be available February 15th wherever finer books are sold. If you are a bartender, mixologist, or have ever stood gazing down the vodka aisle in the liquor store wondering what the difference was between the endless varieties; you’ll want to pick this up.